Sean & Jessica - Married! 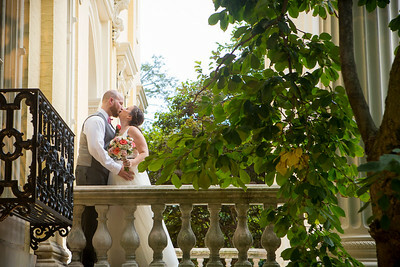 Sean and Jessica were married on September 28th at the Evergreen Library and Museum located in Baltimore, Maryland. Surrounded by friends and family, Sean and Jessica promised to love one another and pretend to care about the others' nerdy pursuits (that cracked me up). I'm honored to have been a part of this amazing day. Their unique and sometimes hilarious ceremony took place in front of a fitting backdrop, a stage designed by Leon Bakst, a famous Russian stage and costume designer. The cocktail hour was in full swing with art and antique furniture setting the mood. The reception followed in the beautiful carriage house located past the gorgeous gardens. Congratulations Sean and Jessica, may every day that you spend together in your new life hold a wonderful surprise for you. Congratulations on your wedding!